Please download this via steam (from http://steamcommunity.com/sharedfiles/filedetails/?id=222076729) if you can. 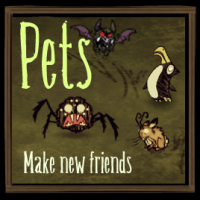 That way it will automatically update when I fix bugs and add new pets. If you get it from here you'll need to manually re-check this page yourself. The link to the forum page doesn't seem to work. Oh, I thought it lead to a topic on the mod. 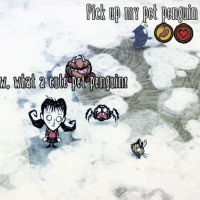 By the way, I noticed when you have the spider, and you inpect it, the character calls it a pet bat. There must be a bug or something becasue for some reason some of the time I can pick up the rabbit, and sometimes it just inspects it. Also, I think when you murder your pet you should lose some sanity. Sounds funny. I'll try it. By the way, can we tame Tree Guards? Nah, I'm kiding. Just gat an idea. What if those pets had some aura? For exemple Cold Resistance aura for the Pingull pet, Sanity Aura for the Rabbit, or Insanity Aura for the Spider. Sounds interesing, I will test this mod. Can you add taming all types of spiders? They are my favourite animals. mod is great but can you make tamable monkeys and slurpers. Hey can you please write, own what food i need to give, like. Also thank you for making, this awesome mod. Can you give a LIST of what the animals eat? Probably something looking like this. Can someone say me how to tame other animals? Does this work with RoG? And if not, will you update?